This week we are delighted to welcome our first guest blogger! 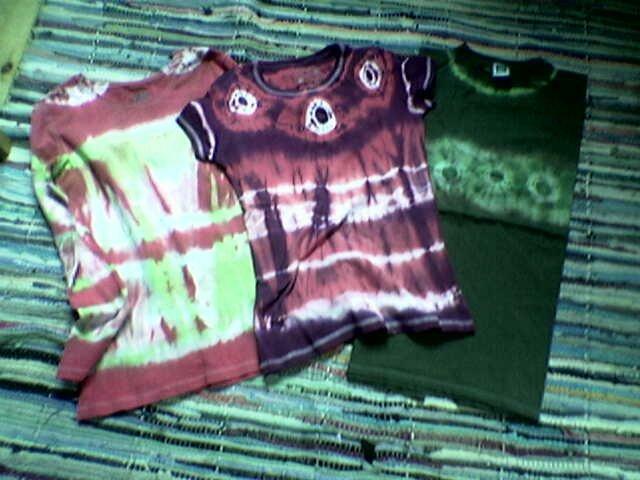 Maya, a long time Brixtonite and a creative soul, shares her wonderful tips on tie-dyeing. We loved reading it, and will be making guest blogging a regular feature. If you’d like to share your own making or recycling adventures, whether as a hobbyist or professional, give us a shout! Everyone likes to have fun. But what does fun mean? Laughter? Excitement? Music? Colour? Creativity? Getting new things? Have all of these and recycle a lot of horrible grotty old rags into vibrant, unique, desirable clothing by getting a few friends together for an afternoon of tie-dyeing. The great thing about tie-dyeing is that it’s wonderfully easy – anyone who can loop anelastic band round a piece of fabric can join in, and the results are quite difficult to predict, so there’s a great sense of excitement when you pull your items from the dye. Best of all, as long as you don’t mind looking like a surfer, it gives a whole new life to clothes that were otherwise heading for the dump. It appeals to all sorts of people– we spent a day doing it last Sunday, and our little group included friends and family from 7 years old to retired! Explain to your participants that the dye will not adhere to parts of their garments which are tightly tied or knotted. Weigh the garments while they are dry, as you must be careful to match the weight of fabric to the appropriate quantity of dye if you want a good colour (E.g. about 600g-1kg of dry fabric to one pack of machine-wash dye). Tie or knot the garments in the areas which you want to stay the base colour (e.g. if you have a white t-shirt, the bits you tie/knot now will stay white). If you want to change the whole colour, don’t tie anything. Note that usual colour-mixing rules apply – if you start with a pale blue t-shirt and dye it yellow, you’ll get a green t-shirt. To get circles, tie your elastic band around a small pebble, bead or coin. To get narrow stripes, tie the elastic band around the whole body, arm or leg of the garment. To get broad, streaky, interesting stripes, tie knots in the garment. To get a really random effect, bundle up the garment before you tie it. To shield large areas from the dye, you can also use plastic bags tightly tied on with an elastic band. Celebrate randomness! If you aim for symmetry you are likely to get frustrated, so for your first attempts focus on having fun with your tying and enjoy the surprise pleasures that result. Put the dye and an appropriate quantity of salt (usually 500g per pack) into the machine and put it on a 40° wash. (Or mix dy & salt with water in a bucket, following instructions on the pack, if handwashing). Feed and water your participants while the wash runs. When the wash has finished, immediately run another wash to rinse out excess dye and clean the machine. Clear away all the food and any grease. Hoik the clothes out of the machine and feverishly untie all your knots and bands to see your results! If you want more than one colour, you must dry out the garment completely between colours, and you may not want to undo all the knots and bands – leave them in where you want to preserve the underlying colour. Then tie new knots and bands where you want the newly dyed colour to be preserved, and dye in the next colour. If you are dyeing items more than one colour, allow lots of time as you need time for tying, dyeing (2 washes – dye wash, rinse wash) and drying for each colour. Note that it is best to build up the colour from light to dark as the dark colour will dominate over light. E.g. if you are using light green and dark blue on a white t-shirt, your first round of tying will result in white marks, your second round of tying will result in light green marks, and the final shade of blue will be blue where it covers white, but more sea-green in the places where it overdyes the green. Finally, put on your new garments and wear them with pride – they’re unique.